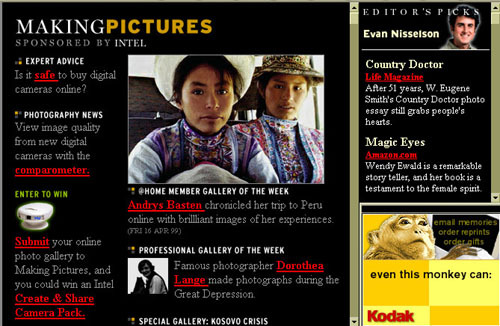 Making Pictures was the first broadband photography portal launched on the Internet in 1998. It provided users with photographic education, resources and tools to make and share photos online. Andrys Basten was one of the @Home members that were highlighted in Making Pictures for creating and interesting website that shared photography. 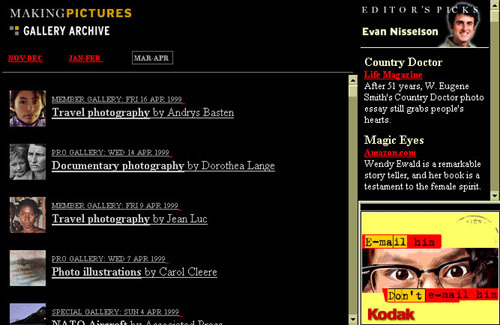 We archived months of weekly professional and consumer galleries from around the world that leveraged digital photography to share memories and stories. Each gallery helped educated visitors on how easy digital photography is and what photographic equipment was used by others.